Common sense has always been a cornerstone of American politics. In 1776, Thomas Paine’s vital pamphlet with that title sparked the American Revolution. And today, common sense—the wisdom of ordinary people, knowledge so self-evident that it is beyond debate—remains a powerful political ideal, utilized alike by George W. Bush’s aw-shucks articulations and Barack Obama’s down-to-earth reasonableness. But far from self-evident is where our faith in common sense comes from and how its populist logic has shaped modern democracy. 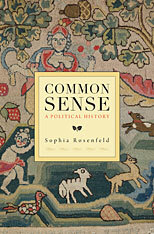 Common Sense: A Political History is the first book to explore this essential political phenomenon. The story begins in the aftermath of England’s Glorious Revolution, when common sense first became a political ideal worth struggling over. 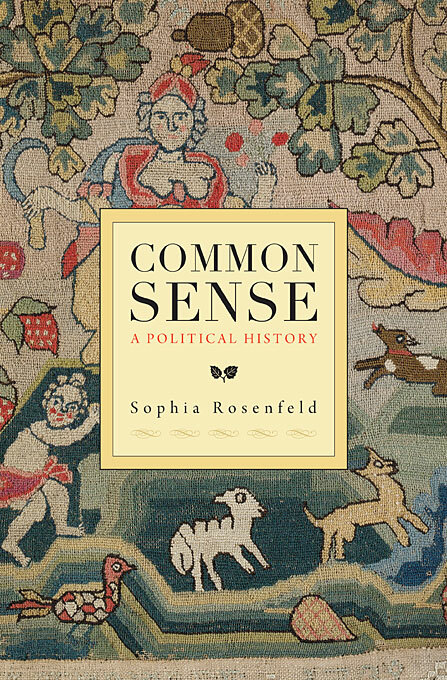 Sophia Rosenfeld’s accessible and insightful account then wends its way across two continents and multiple centuries, revealing the remarkable individuals who appropriated the old, seemingly universal idea of common sense and the new strategic uses they made of it. Paine may have boasted that common sense is always on the side of the people and opposed to the rule of kings, but Rosenfeld demonstrates that common sense has been used to foster demagoguery and exclusivity as well as popular sovereignty. She provides a new account of the transatlantic Enlightenment and the Age of Revolutions, and offers a fresh reading on what the eighteenth century bequeathed to the political ferment of our own time. Far from commonsensical, the history of common sense turns out to be rife with paradox and surprise.